Starwood Hotels & Resorts Worldwide, Inc. (NYSE:HOT) today announced the debut of its trailblazing Element brand in Europe with the opening of Element Frankfurt Airport. This marks the first Element hotel outside of North America. Offering bright, modern design and green-minded sensibilities, the hotel is located in Gateway Gardens, Frankfurt’s new business district adjacent to Frankfurt International Airport, Europe’s third-busiest air travel hub. Element Frankfurt Airport offers travellers a reimagined interpretation of the extended stay experience and an atmosphere to fuel a life in balance and on the move. Built in the heart of the growing new business district near the global headquarters of Lufthansa, Condor and DB Schenker, the hotel is only a few minutes away from one of the biggest international airports worldwide, Frankfurt International Airport. The hotel features 133 spacious and airy extended stay studios and one-bedroom suites, all with modular furniture, flat-screen televisions, large desks with open shelving and custom-designed closets with ironing board. Every room comes with a fully equipped energy-efficient kitchen, spa-inspired bathrooms including invigorating rain showers and signature Heavenly(R) Beds to ensure a good night’s rest. Lim’ones, the all-day dining restaurant and bar, serves regional Spanish cuisine from 7am until midnight including a healthy breakfast, shared lunches with tapas-style dishes, and `a la carte dining meals. The hotel has a 24-hour fitness centre – Motion – plus a flexible meeting space and a business centre. Guests at Element Frankfurt Airport can enjoy complimentary Wi-Fi throughout the hotel, the brand’s signature healthy and complimentary RISE breakfast; Restore, a 24/7 grab-and-go gourmet food pantry to buy everything they need to make delicious meals in-room; RELAX evening receptions. Additionally, 24-hour laundry facilities with washers and dryers are available for guests’ convenience. Originally launched in 2008, Element became the first major hotel brand to mandate that all properties pursue the US Green Building Council LEED certification (Leadership in Energy and Environmental Design) for high-performance buildings with energy-efficient appliances used in all properties. Recognised as an industry leader in the eco-space, Element’s global portfolio is set to double within two years from 15 to 30 hotels by the end of 2017. In addition to Element Frankfurt Airport, the brand will debut in other markets including a new Element hotel in Suzhou, China in 2015 and as part of a Aloft and Element dual-hotel development in the historic Tobacco Dock section of East London. Starwood currently has 25 hotels throughout Germany under six of its nine distinct and compelling brands. 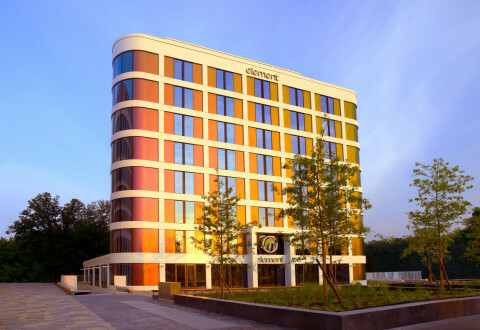 Element Frankfurt Airport is Starwood’s fifth hotel in Frankfurt, joining Le M’eridien Parkhotel Frankfurt, The Westin Grand Frankfurt, Sheraton Frankfurt Congress Hotel and the Sheraton Frankfurt Airport Hotel & Conference Center. Element(R)Hotels is made to order for guests in the know and on the go. Its bright design defies convention, bathing guest rooms and public spaces in natural light. Stylish and sustainable throughout, Element offers extended stay comfort with a conscience and lots of signature amenities from its healthy RISE breakfast and RELAX evening reception to saline swimming pools, spacious fitness centers, bikes to borrow and electric vehicle charging stations. Starwood’s latest brand innovation, Element made history in 2008 as the only major hotel brand to pursue LEED certification for high-performance buildings brand-wide. To date, there are Element hotels in 12 markets in North America with new domestic and international hotels in development. Visit www.ElementHotels.com or connect on Facebook. Starwood Hotels & Resorts Worldwide, Inc. is one of the leading hotel and leisure companies in the world with nearly 1,200 properties in 100 countries, and 181,400 employees at its owned and managed properties. Starwood is a fully integrated owner, operator and franchisor of hotels, resorts and residences with the following internationally renowned brands: St. Regis(R), The Luxury Collection(R), W(R), Westin(R), Le M’eridien(R), Sheraton(R), Four Points(R) by Sheraton, Aloft(R), and Element(R). The Company boasts one of the industry’s leading loyalty programs, Starwood Preferred Guest (SPG(R)), allowing members to earn and redeem points for room stays, room upgrades and flights, with no blackout dates. Starwood also owns Starwood Vacation Ownership, Inc., a premier provider of world-class vacation experiences through villa-style resorts and privileged access to Starwood brands. For more information, please visit www.starwoodhotels.com. Bari Gruppe GmbH & Co. KG is a Munich based company specialized in development, leasing and operating mid and upscale branded hotels in Germany and other European countries. Please visit www.barigruppe.de for more information.